My career started as a photojournalist for a weekly town newspaper. My style has evolved to include nature, dreamscapes, landscapes, and travel & tourism. I’ve been awarded grants and won awards for my imagery, and have exhibited on both coasts of the United States. Photography Then– My first “real job” was at a local newspaper in my hometown. After talking with the editor, he gave me a few photo assignments on a trial basis. A month into this new photojournalist position, I had my first of many front page photos. It meant lugging 50 pounds of camera equipment through seventeen local communities on assignment for human interest and breaking news stories (and through all types of crazy New England weather, too!) I stayed with the newspaper for 7 years before enrolling in computer training school. My formal art training at Rhode Island School of Design included alternative photographic processes and design. Photography Now – I have been exploring the links between art, visual therapy, and the realities of the dream state for many years. My work, while being a deeply personal exploration of my own dreams, jars the viewer with its beauty of light interplay, form, and design. Its my intention to create a tactile beauty that brings viewers into my private world while simultaneously giving one the permission to touch, feel, and experience each piece, while making it part of his/her own world, language, and life. I take a very “Zen” / organic approach in creating recognizable images that strike a resonate chord. My approach to making photos is a quietly hidden metaphor for the ever changing fluidity of our dreams and frailty of beauty. A haunting reminder of how both shimmer before us, but can disappear in the blink of an eye. An eternal aide memoir that everything is not always as it appears to be. A variety of photographs are available to purchase from Fine Art America. I have chosen Fine Art America because of their fair pricing, high quality prints, and customer satisfaction with delivery services. If you need a large scale print, wallpaper, or mural size, please email me. I partner with a New England based printer for those sizes. 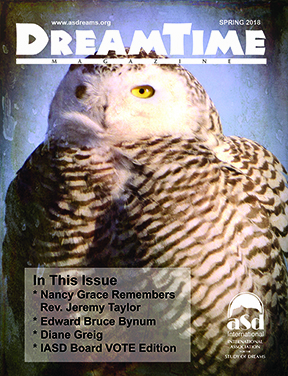 Cover and internal photographs and article: “A Story from my Ordinary Waking Life” for the Spring 2018 DreamTime Magazine.